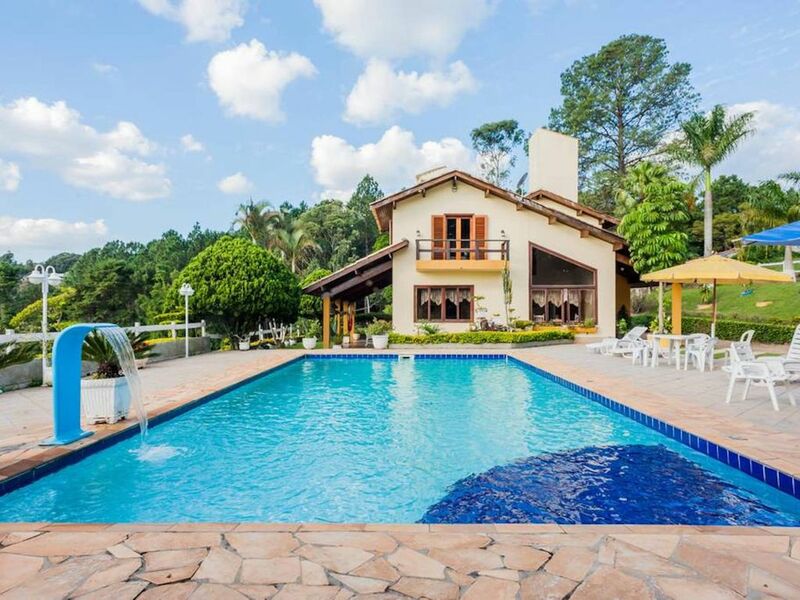 Sitio Renascer is located in the neighborhood of Rosario in Atibaia. The house has 3 bedrooms and two suites, 3 bathrooms, kitchen, 2 living rooms, dining room, laundry, balcony and a great gourmet area. The American style kitchen is complete with stove, refrigerator, microwave, oven, coffee maker, blender and all the utensils needed for your stay. Gourmet area with TV40 ', barbecue grill, pizza oven, freezer, table with 8 chairs a TV49 "to assist games and in the games area has a pool table and pimbolim. In the yard of 3000 meters we have the waterfall pool of 800,000 thousand liters of water, sun umbrella and chairs for sunbathing, foot of fruits and a mini soccer field. Space for at least 8 cars inside the enclosed site. We offer wood for the fireplace in the winter where guests can make cheese fondue and it is also possible to make bonfire in the backyard and has a pond to fish. NOTE: The house has an extra room in the outside, with capacity for up to 5 people, being charged separately / per person). IMPORTANT: Cleaning fee per stay, is not included and will be charged separately.